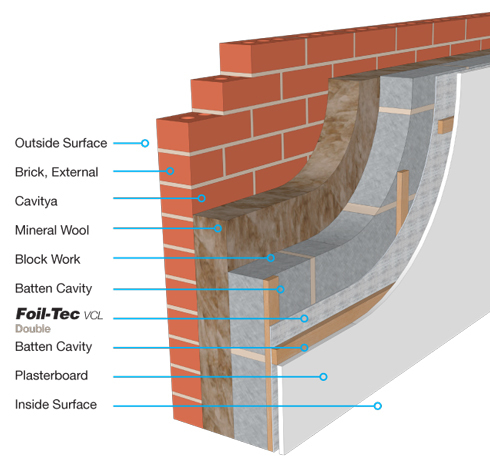 Installation of Foil-Tec VCL Single for cavity wall applications and additional insulation products should be in accordance with the manufacturers fixing instructions, certification and current good building practice. 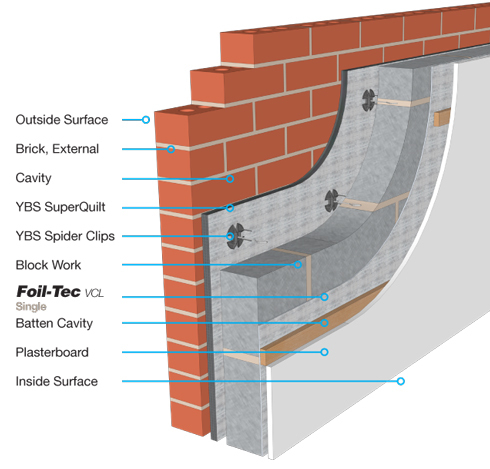 Foil-Tec VCL is applied directly from the roll either vertically or horizontally depending on the wall height, pulled tight and stapled onto the wall. The foil side of the material should face the adjacent air space. All overlaps and perimeters must be taped and sealed using YBS Foil Tape. Vertical counter battens, minimum 25mm by 38mm are fixed to wall at 400mm centres. Battens must always be placed at the top and bottom of the wall and around the perimeter of doors and windows. 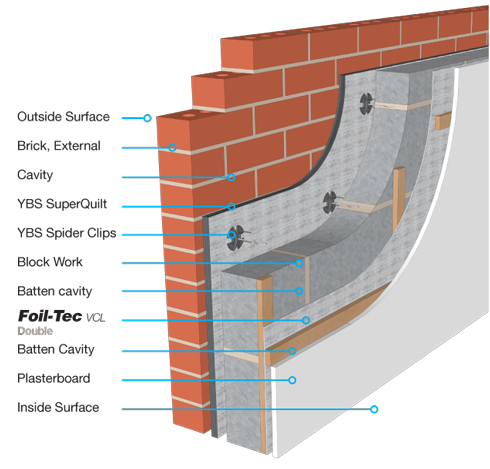 Installation of Foil-Tec VCL Double for cavity wall applications and additional insulation products should be in accordance with the manufacturers fixing instructions, certification and current good building practice. Battens are fixed to the wall Foil-Tec VCL is then applied directly from the roll either vertically or horizontally depending on the wall height, pulled tight and stapled onto the battens at minimum 300mm centres. The foil sides of the material will be facing the cavities formed. All overlaps and perimeters must be taped and sealed using YBS Foil Tape. Foil-Tec VCL is applied directly from the roll either vertically or horizontally depending on the wall height, pulled tight and tack stapled onto the wall. The foil side of the material should face the adjacent air space. All overlaps and perimeters must be taped and sealed using YBS Foil Tape.